100% Cotton Crew Neck Tee. Made in USA. This is a tee that gets softer with age and washing. This Tee is smaller than some of our other tee shirts. Before you wash it, it will be larger and will shrink after the first wash. Soft and relaxed, yet durable and versatile. Great staple for your wardrobe. Wash with similar color items for the first couple times. This item fits like a Gildan or Hanes Tee. We recommend ordering UP a size. Gender Neutral sizes. Sizes S, M, L, XL, XXL . 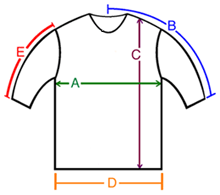 Check our Sizing Chart for measurements of the garment before shrinkage.